Professor Sarah M. Barry, far right, demonstrates movement as she teaches a modern dance class. Barry received an Outstanding Commitment to Teach Award from UA’s National Alumni Association this year. From the 2014 Celebrating Excellence | Between teaching classes, conducting researching, sharing their work off-campus and working with students outside the classroom, professors often don’t have time to consider the impact they’re making. For Sarah M. Barry, associate professor of dance, receiving the University’s highest honor for excellence in teaching did just that – it forced her to slow down and made her realize that she is, in fact, doing what she set out to do. 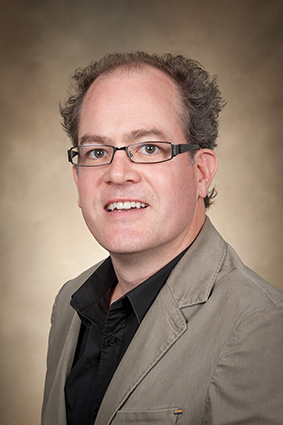 Dr. James McNaughton, assistant professor of English, who also received the award this year, felt similarly. Dr. James McNaughton also received an Outstanding Commitment to Teaching Award from UA’s National Alumni Association this year. Barry and McNaughton follow a long line of recipients who have received the award since its inception in 1976. Giving students ownership, challenging their ideas and giving them a sense of why the curriculum matters are key components of both professors’ teaching approaches. Barry, who teaches a wide range of dance classes, pushes students most in her choreography class, where she challenges their ideas about the purpose of dance. At the beginning of the semester, she said most dancers rely on what they already know – dance as a vehicle for performance. “They’re just kind of making up classroom routines – things that show off how they can turn or how they can get their leg really high. They’re showing off their bodily skill,” she said. By the end of the semester, dance becomes a vehicle for communicating messages, with dancers crafting movement around specific ideas. To give students a sense of overarching purpose, Barry tries to weave all elements of the curriculum together, merging technique with history, anatomy and choreography. 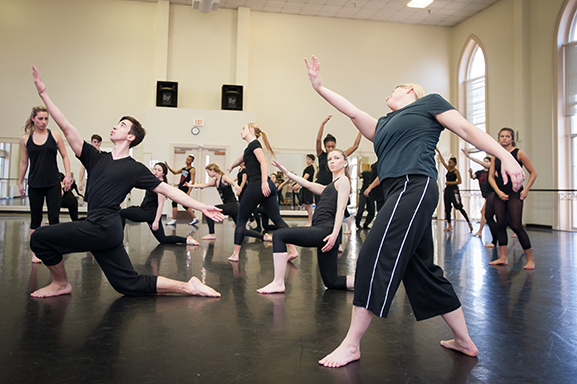 Ownership comes in the form of the College’s pre-professional dance company Alabama Repertory Dance Theatre, or ARDT, in which students experience what it’s like to be part of a real dance company. As Barry begins choreographing a dance that students will eventually perform, she shares general ideas of theme and movement with her dancers and then asks them to improvise. McNaughton, while focused on writing and literature, has a similar line of attack. For him, teaching is about challenging students’ ideas by taking everything they say seriously, no matter whether the students meant it so or not. McNaughton also helps his students find value in their education by immersing them, quite literally, in the books they read. In one of his classes – a class on James Joyce’s modern epic Ulysses, a book about blurring the lines between public and private space – McNaughton gives his students the option of taking a not-so-traditional final exam. The students have the option of participating in a “marathon reading” of the book, in which they read the book cover-to-cover, together, in a single day. As the book moves throughout Dublin, so the students often move throughout Tuscaloosa. They mimic the place they are in the book as they read the book aloud at every stage, bringing the act of reading, something generally considered to be private, into the public sphere. McNaughton also gives the students ownership within the classroom. In a class on 20th century British and Irish poetry, each student read a book of contemporary Irish poetry and presented a selection of the poems. Can Barry or McNaughton imagine being something other than a teacher? Only if they really, really try. Barry, who grew up in a family of teachers, also said she couldn’t imagine what else she’d be doing if she weren’t teaching. “I would probably still be a choreographer, and certainly part of being a choreographer is teaching the people in your company,” she said. “I can trace very specifically why I teach back to a class that I took in the eighth grade. In that class, we learned about history and anatomy and choreography and lots of different movement techniques. That was my first time to really see the academic side of dance. I enjoyed that range of ideas presented in a class so much that I immediately knew that’s what I wanted to do. Because it was such a revelation to me at the time, I wanted to be able to share that.